This is the third section of our ultimate guide to traveling in Patagonia. Read on or check out the contents to visit another section. Temuco is a large and modern city found 680 km south of Santiago. While the city is dynamic, it does not have any particular charm with the exception of being a great point of departure for many excursions around the lake region and the many national parks found in the surrounding area. Temuco is also well known for its Mapuche culture, a proud and rebellious community of around 20 000 in the area today, who has fought continuously against every invaders in the past. Museo Regional de La Araucania (USD$1 entry fee, opened from 9h30 to 17h30 from Tuesday to Friday, from 11h to 14 on Saturday and from 11h to 14h on Sunday): A good idea to start your trip with a little knowledge about the Araucania population history. The museum is found in a beautiful pioneers style building dating from 1924 and shows impressive ancient artefacts, such as one of the Mapuche's incredibly long canoe. Monumento Natural Cerro Nielol (USD$2 entry fee, opened from 8h to 19h every day): The Cerro Nielol is a stunning hill covered in 90 hectares of wild forest found at the heart of the city. You will find there an abundance of Copihue (Lapageria Rosea), the national flower of Chile, which grows mainly between March and July. Parque Nacional Conguillio (USD$7 entry fee for adults and USD$4 for children): A beautiful park made of forests, lakes and canyons famous for its reserve of Chilean araucarias trees. A small part of the territory is a ski station but the main attraction of the park is its active 3125m volcano, the Llaima, which last erupted on New Year 2008. We recommend the superb Sierra Nevada trek (7km, 6h return trip) filled with impressive araucarias trees, which starts on the Playa Linda car park. For a short trek, the Canadon Truful-Truful 30 min trek (0.8 km) around the canyons is a great option. Tradiciones Zunny (Tucapel, 1374): Enjoy a Chilean-Mapuche organic fusion cuisine in this underground local's secret spot. The restaurant serves fresh and simple food for a cheap price (USD$5 per person). La Pampa (San Martin, 137): This hotspot for carnivores gets the job done with their delicious beef (USD$18 per person). Gohan Sushi (Espana, 390): An original sushi spot, great for those who need a break from Argentinean food, serving funky rolls and shrimp dishes. (USD$8 per person). Centro de Información Ambiental (Laguna Conguillio, opened from 8h30 to 21h30 from the 16th of December to March and from 8h30 to 13h and 14h30 to 18h from April to the 15th of December): Get a plan of the possible treks in the Parque Nacional Conguillio at the Centro de Información Ambiental. Villarrica is an authentic Chilean city, less touristy than its neighbor city, Pucon, found on the other side of the Lago Villarrica. Pucon is found between the Villarrica lake and the Villarrica volcano and is nowadays a magical place for those who are passionate about sports and adventure. However the idyllic place might turn to a nightmare for those who are travelling during high season. Tourists on organised tours, Brazilian snow lovers, backpackers seeking adventure and Chilean families on holidays will all be part of your stay in Pucon. Villarrica: Muestra Cultural Mapuche (in January and February): A place for local artisans to show their work accompanied with traditional Latin American music and ritual dances. Aurora Austral, Patagonia Husky: A reserve of about 50 Siberian and Alaskan huskies. If you dream of a sled dog excursion, you may leave for a memorable day trip (USD$100). Also, if you are up for adventure and your time and budget allows it, you can leave on an excursion over the Andes for 7 days (USD$3,300). Rafting and Kayak: Pucon is famous for the numerous water sports available around the city. Kayak Pucon is an agency that offers different excursions, such as a 3 day kayak course (USD$280) or a half a day kayak excursion on a ducky (USD$30) suitable for those who have less experience with water sports. Parque Nacional Villarrica: Do not miss the famous trek on the 2847m Volcan Villarrica (USD$75) with a possibility to spend a night in bungalows (USD$60 to USD$90). You can do voluntary work for a period of 4 to 12 weeks for those who want to spend more time on the volcano. Some travel agencies recommend that you walk up the 2360m Volcan Quetrupillan (6h trek), neighbor to the Volcan Villarrica, due to the latter's recent eruption. The park's third volcano is found on the border with Argentina, Volcan Lanin (3747m). We recommend that you ask information directly at the tourism office or to travel agencies upon arrival as the recent volcano eruption can result in changes regarding the park's activities. Cycling on Ojos de Caburgua: You can easily rent mountain bikes around the city of Pucon to cycle over the famous Ojos de Caburgua trail. Take the route towards the airfield about 4km east of the city and cross the Rio Trancura. Rio Liucura Valley: Towards east of Pucón, you will find the Rio Caburgua Valley. To the north, the Lago Caburgua and its stunning Playa Blanca, situated 24 km further, as well as the waterfall-heavy Ojos del Caburgua, will not leave you disappointed. To the northeast, the Camino Pucón-Huife road leads to countless hot springs, the El Cani nature sanctuary and views of the silver-ribbon Rio Liucura. Curarrehue: A peaceful village perfect if you wish to immerse yourself into the Mapuche culture. Its small museum, The Aldea Intercultural Trawupeyum (USD$1 entry fee, opened from 9h to 20h Monday to Friday and from 11h to 20h on weekends during January and February and only from 9h to 18h Tuesday to Sunday from March to December), will introduce you to the history of the Mapuche. Parque Nacional Huerquehue (USD$7 adult entry fee and USD$4 for children): Only 35 km away from Pucon, the Parque Nacional Huerquehue is a great trekking spot. The Los Lagos 4h trek (7 km) brings you through a forest of lengas before penetrating the famous araucarias forest surrounding a few gorgeous and peaceful lakes. Many consider the Cerro San Sebastian 7h trek (16 km) to be the best trekking of the region. You will start at the entry of the park, situated at 700m of altitude, and climb up the Cerro, to 2000m of altitude, from which you can see 8 volcanos and 14 lagoons if the weather allows it. There are a few allowed campsites around the park, including Lago Tinquilco (USD$23 for a spot) and Renahue (USD$23 for a spot). If you decide to stay at the Refugio Tinquilco, you can opt for a camping spot or a bed in a dormitory (both are USD$23), or you may go for a little more comfort and stay in a bungalow (USD$78). The luxury campsite, found at the beginning of the Lago Verde trek, has a sauna in the middle of the forest and offers meals for USD$13. Lago Calafquen: The small town of Lican Ray, 30 km south of Villarrica, surrounded by campsites and the peaceful town of Conaripe, 22 km east of Lican Ray, are attracting more tourists every year due to their location along the Lago Calafquen and its spectacular black sanded beach. Buses leave every day from Villarrica to Lican Ray (USD$1.20 / 30 min) and Conaripe (USD$1.70 / 1 hour). El Sabio (in Villarrica - Zegers, 393): Lovely pizzas served on small cutting boards. The restaurant is run by a creative and friendly Argentine couple who will make you rediscover Chilean pizza (USD$10 per person). Brazas (in Villarrica - General Korner, 145): Do not miss the postcard-framed volcano sunset view from the bay window of Las Brazas. Attentive and lovely service, great steaks but also delicious pork ribs and other meals on the gourmet menu are worth trying as well (USD$18 per person). The Travellers (in Villarrica - Valentin Letelier, 753): Travel around the world with your food at this resto-bar that offers Italian, Mexican and Asian dishes. Happy hour from 6pm to 10pm! (USD$10 per person). Cocina Mapuche Mapu Lyagl (in Curarrehue): Enjoy a traditional Mapuche meal in a lovely setting. The lovely service is welcoming and the restaurant offers a set menu of rich and tasty food, vegetarian or with meat. A wonderful experience to develop your tastebud (USD$10 per person). La Fleur de Sel (Camino Pucón Huife Km28): A gourmet destination for foodies who enjoy innovative cuisine. A basque-country chef offers a Mapuche infused French menu mostly with meat, 32km east of Pucon (USD$18 per person). Trawen (O'Higgins, 311): At Trawen you will find excellent home-style breakfast, freshly-baked food, vegetables from their own certified organic gardens, the town's best craft beer selection, bacon-wrapped venison and many more gastronomic work and innovative flavors (USD$10 per person). La Picada (Paraguay, 215): Knock to gain entrance in this local's underground secret eatery. Set lunches include salads, pastel de choclo, cazuelas, pasta (USD$5 per person). Viva Peru (Lincoyan, 372): Delicious classic Peruvian dishes are served here: ceviche (raw fish and onions marinated in citrus juices and spices), tiradito (onion-free ceviche), chicharónes (deep-fried pork rinds) and aji de gallina (creamy chicken stew with cheese, peppers and peanuts), chifa dishes (Peru's famous Chinese fusion) - (USD$22 per person). Centro de Información Ambiental (at the entry of the Parque Nacional Huerquehue, opened from 10h30 to 14h30 and from 16h30 to 19h30): A map of the park and any information regarding your stay in the park can be asked here. 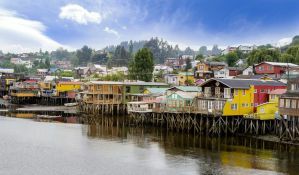 Found 1,016 km away from Santiago de Chile, Puerto Montt is famous for its beautiful lakes and its germanic architecture, old wooden houses and a cathedral made of cypress wood. The capital of the Lake Region is a good starting point for many memorable excursions in the area. Market on Avenida Angelmo: Dive into the chaotic but somewhat wonderful fish market of Avenida Angelmo and stop at one of the restaurants to eat delicious seafood. The artisanal objects market is found 3 km west of the city center towards the fishing harbor of Puerto Montt. You can easily move around the city by using the colectivos (city bus USD$1 per ride). Iglesia Catedral (Plaza de Armas): The monument, entirely built with alerce wood, is the oldest building of the city. Casa del Arte Diego Rivera (opened from 9h to 13h and from 15h to 18h30 from Monday to Friday): Museum presenting Hardy Wistuba's work as well as other local artists (painters, photographs and scupltors). Puerto Varas: A charming town, only 23 km away from Puerto Montt and surrounded by the Osorno and Calbuco volcanoes as well as the impressive Llanquihue lake. In terms of landscape, accommodation and activities, Puerto Varas is well served! Kayak, paddle, canyoning, rock climbing, trekking, ski, fishing, you name it! If you decide to stop in that area, we recommend that you stay in Puerto Varas. In Puerto Varas, you can visit the Paseo Patrimonial, a pedestrian tour across 10 houses classified as national monuments. Cochamo and Rio Puelo Valley: While this area is not very well known among tourist, it is worth the detour! 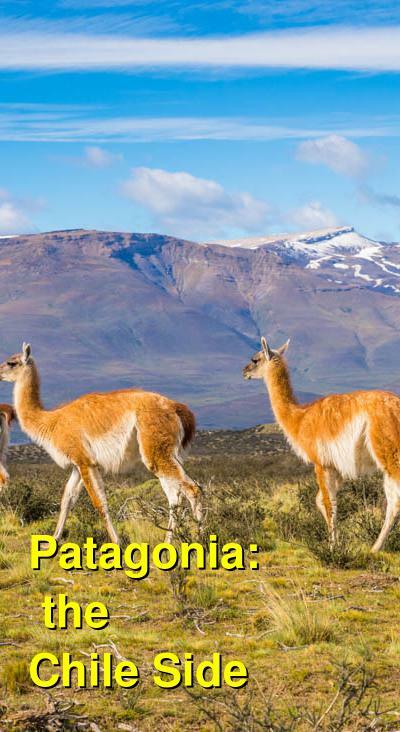 Agencies such as Secret Patagonia or Campo Aventura organizes excursions on horses, mountain bikes or by foot to discover the beautiful valley. You may even end up spending a night in the heart of the forest at Domo Camp (USD$78 for a cabana) or simply stop there for a delicious lunch. Parque Nacional Vicente Pérez Rosales: The Lago Todos Los Santos, the Volcan Osorno, the Volcan Puntiagudo and the Monte Tronador are well-known sites found in the Parque Nacional Vicente Pérez Rosales. Trekking in the park will be a journey full of surprises, as one lake may be hidden by another. The Sendero Los Alerces, which continues on to the Sendero La Picada will bring you to a spectacular viewpoint on the park's lakes and volcanoes including the Volcan Osorno. Buses leave regularly from Puerto Varas to the park. Do not miss the Saltos del Petrohué waterfalls (USD$2.30 entry fee), found 6 km away from the entry of Petrohué, a small town where you will find the pier for Cruce de Lagos boats going to Peulla. For ski lovers, the Centro de Ski y Montana Volcan Osorno in Ensenada offers ski and snowboard equipment rentals and a pass for half a day (USD$30) or a full day (USD$38) of unlimited ski lift access. During off-season, the ski lift (USD$22) can be taken to reach a few trekking paths with spectacular views. You can access the ski station from Ensenada by bus or with your car, taking the road Ensenada-Puerto Octay until you reach a sign about 3 km away from Ensenada, indicating you to turn right and continue for 10 km on a dirt road. If you call a day before, you can spend a night at the bottom of the slopes in the Refugio Teski (USD$19-24 for a bed in a dormitory or USD$55 for a bedroom or USD$74 for a bedroom with private bathroom), where you can relax in a hot bath in the mountain (USD$63 to rent a bath with appetizers and a pisco sour cocktail) or enjoy the 2 drinks for 1 at happy hour. Sanito (Copiapo, 66): A cosy restaurant serving fresh and healthy food in an artistic and funky atmosphere (USD$5 per person). You can opt for a soup, salad or entrée menu served with a juice, coffee or tea. Sanito also serves sandwiches and salads for a good price. Cotelé (Juan Soler Manfredini, 1661): If you still haven't had enough of the Chilean meat check out this steakhouse and you will not be disappointed. (USD$13 per person). Puerto Fritos (Presidente Ibanez 716): It is not a surprise that this is one of the local's secret hotspot, it has the best views in town! Excellent seafood directly brought from the market nextdoor. The seafood soup and the ceviches are definitely worth trying (USD$8 per person). Chile Picante (Vicente Pérez Rosales, 567): Do not get discouraged by the uphill walk to get to the restaurant, the view on the city and the sea and the three-course-menu is worth every drop of sweat! Just a few choices on the daily-changing menu, fresh food from the market, excellent presentation and original use of flavors. (USD$13 per person). La Jardinera (in Puerto Varas, Blanco Encalada, 1160): All tables have views on the lake. A trendy and modern restaurant where it is worth grabbing a bottle of wine or a few beers. The UK-inspired menu and relaxed atmosphere will make a whole experience out of your evening. Casavaldés (in Puerto Varas, Santa Rosa, 40): An elegant restaurant with a spectacular view, serving typical south of Chile food, in other words delicious seafood. Crab, salmon, you name it! Sophisticated and attentive service. Masala Chai (in Puerto Varas, Santa Rosa, 716 B): While vegans and vegetarians might find some difficulties when travelling in this region of the world, Masala Chai restaurant welcomes you with open arms and mainly with exquisite vegetarian food, freshly baked goods and yoga on Wednesday nights. Puerto Montt Conaf (Ochagavia 458, opened from 9h to 12h45 and from 14h30 to 17h30 from Monday to Thursday and until 16h30 on Friday): For useful information on any of the national parks of the region. Do not walk around the train station or the seafront at night. These areas can potentially be dangerous during nighttime. The capital of Chiloé, modern and dynamic, has succeeded in keeping its authenticity even though it now has many gigantic supermarkets, hotels and other touristic infrastructures. It is the perfect spot to go explore the stunning sites in the region of Chiloé Island. Iglesia San Francisco de Castro (opened from 9h30 to 20h in January and February and from 9h30 to 12h30 and 15h30 to 20h30 from March to December): Neo-Gothic and Classic styles are combined in the architecture of the famous Iglesia San Francisco de Castro, designed by Italian architect Eduardo Provasoli and completed in 1912. Museo Regional de Castro (opened from 9h30 to 19h from Monday to Friday, from 9h30 to 18h30 on Saturday, from 10h30 to 13h on Sunday during January and February and from 9h30 to 13h and 15h to 18h30 from Monday to Friday and from 9h30 to 18h30 on Saturday during March to December): The small museum nearby the Plaza de Armas offers a collection of huilliches relic, music instruments, traditional farming tools as well as black and white photographies of the 1960's earthquake to recount the history of Chiloé. Ancud: A great starting point for those who plan an excursion to visit the penguin colonies of Monumento Natural Islotes de Punihuil (USD$27). You can also do whale watching, bird watching and trekking or kayak along the bay around Ancud. The Centro de Visitantes Immaculada Concepcion (USD$1, opened from 10h to 19h from December to February and from 10h to 18h from March to November) is a fabulous museum located in an old convent, which informs you on the 16 churches classified by the UNESCO and their complex wood structures. You may also appreciate the Museo Regional Aurelio Borquez Canobra also called Museo Chilote (USD$1 for adults and USD$0.50 for children), which will inform you about the history of the island. North-west of the city, the remains of the XIX century fortress, the Fuerte San Antonio (opened from 8h30 to 21h from Monday to Friday and from 9h to 20h from Saturday to Sunday) are worth visiting. On the road to Isla Quinchao (local buses leave every day to Dalcahue and to Achao with a stop in Curaco de Vélez, between USD$2 and USD$2.50 for a bus ticket): You can spend a few hours wandering around the famous Artisan Market (opened every day from 9h to 18h from December to February but its peak day is on Sunday, only opened on Sunday from 9h to 17h from March to November) of Dalcahue, a small town 20 km north of Castro. You can also visit the XIX century church, Nuestra Senora de Los Dolores, also classified as UNESCO World Heritage. Then, after jumping on the ferry to reach the Isla Quinchao, you can make a stop in Curaco de Vélez, a town founded in 1660 in typical Chilean architecture. A final stop in the island's largest city, Achao to visit Chiloé's oldest church, Iglesia Santa Maria de Loreto. Parque Nacional Chiloé (USD$2.30 entry fee, opened from 9h to 20h30 from December to mid-March and from 9h to 18h30 from mid-March to November): A great variety of bird species, Darwin's foxes, and a good amount of pudu, the smallest deer of the world are found in the Parque Nacional Chiloé. You can access the park via Cucao, a small village an hour away from Castro. The most visited trek is the Sendero Chanquin-Cole Cole, a 25 km path along the Lago Huelde, the Rio Cole Cole and the Rio Anay. The Sendero Interpretivo El Tepual will bring you 1 km into the heart of the forest and the Sendero Dunas de Cucao is a 2 km long path will bring you to a long white sanded beach. Quellon: The terminus to the legendary Ruta 5. An ordinary city not worth the detour. Boats leave to Chaitén for USD$25 with Naviera Austral every Thursday at 3pm. Sacho (Thompson, 213): One of the first sophisticated seafood restaurant that appeared in Castro, Sacho has hold on to its reputation with its fresh fish preparations (USD$10 per person). Rucalaf Putemun (in Putamun, Ruta a Rilan Km 3.6): Found 7 km outside of Castro, the rustic while sophisticated restaurant is one of Chiloé's destination eatery. A friendly and attentive service and contemporary Chilean cuisine, all in a colorful, cozy cabin-like room (USD$12 per person). Hostalomera (Balmaceda, 241): Choose from the five delicious home-cooked dishes served with an appetizer and a juice for only USD$4.50 and relax in the artistic atmosphere of Hostalomera. Mecadito (Pedre Montt, 210): The restaurant offers one of the most innovative menus of Castro. Crab phyllo dough wraps doused in vermouth, tempura hake over mashed fava beans, stuffed shells with surf clams in pil-pil sauce and other delicious dishes made with local ingredients (USD$12 per person). Ancud Conaf (Errazuriz 317, from 9h to 12h50 and from 14h30 to 17h30 on Monday and Wednesday and from 9h to 12h50 and 14h30 to 16h30 on Friday): Information on the national park. Ancud Sernatur (Libertad, 665, opened from 8h30 to 19h from Monday to Friday, from 9h30 to 19h on Saturday and Sunday from December to February, from 8h30 to 18h on Monday to Thursday and from 8h30 to 17h on Friday from March to November): Tourism office of the city. Futaleufu is a village 155 km south-east of Chaitén. The perfect base for those who want to discover the region and practice adventure sports. Trekking, rafting, kayak, horseback riding or fly-fishing will be part of your experience in Futaleufu. Rafting and Kayak: Rafting on the Futa river is mainly for those who are experienced (USD$63 per person for half a day). For a family experience, we recommend a rafting excursion on the Rio Espolon (UD$24 for 5h) or on the Lago Espolon for complete beginners who wish to learn in group excursions. The Ko'Kayak agency organises kayak excursions in the fjords of the Parque Pumalin. Parque Pumalin: The biggest private park of Chili, created by American Douglas Tompkins. It was closed from 2008 to 2011 due to the eruption of the Chaitén volcano. The legendary trek on the crater of the Volcan Chaitén is worth its reputation (5h return trip). After walking on a path dug into the rock, you reach a spectacular viewpoint on the steaming crater. The Sendero Cascadas, a smaller trek of only 3h return trip, will bring you through a evergreen and dense forest to reach a beautiful waterfall. Puyuhuapi and the Parque Nacional Queulat: Filled with dense forests of fern and beech trees, rivers and fjords, the Parque Nacional Queulat (USD$8 entry fee, opened from 8h30 to 17h30) is a beautiful trekking spot. Do not miss the stunning Ventisquero Colgante glacier or the Rio de las Cascadas. We recommend that you ask information about trekking in the Parque Nacional Queulat at the Centro de Informacion Ambiental Conaf (opened from 8h30 to 17h30) or any tourism office. Puyuhuapi is a good base for those who want to discover the Parque Nacional Queulat. It was founded by four Germans who settled in this rain forest zone in 1935. Many textile workers joined the colony until it became famous for its Fabrica de Alfombras, which can be visited today (USD$8 per group). Martin Pescador (Balmaceda, 603): One of the best places to eat in Futaleufu. Most products are grown in their garden. An intimate boutique restaurant with a roaring log fire, a good wine selection and a four-course meal option, perfect for a special dinner (USD$13 per person). El Barranco (Bernardo O'Higgins, 172): Innovative and perfectly-balanced combination of ingredients. Delicious wild hare and Patagonian lamb. Attentive and welcoming service (USD$25 per person). Rincon de Mama (O'Higgins, 465): While the restaurant does not appear particularly attractive from outside, you would be surprised by the quality of the food and the friendly service. This simple yet cozy little restaurant has the best deals in town for home-cooked meals (USD$10 per person). Café Mandala (Pedro Aguirre Cerda, 545): A small cafe perfect for breakfast or a cold afternoon. Friendly and welcoming place. Do not hesitate to start a conversation over their delicious hot chocolate! (USD$10 per person). Come to Futaleufu with cash. Most places do not accept cards and there is only one cash point (BancoEstado at the intersection of O'Higgins and Manuel Rodriguez) in the village, which only accepts MasterCard. Tourism Office (O'Higgins, 536, opened from 9h to 21h every day): Information on trekking in the region. 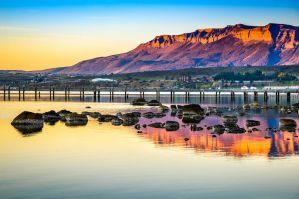 The capital of the rural region of Aysén, Coyhaique does is not particularly interesting to visit but remains a great base for those who love outdoor activities. If adventure runs through your veins, you must climb up the Mackay or the Castillo peaks. Lago Elizalde: Enjoy a beach day at the Lago Elizalde, only 33 km away from Coyhaique or a kayak trip for those adventure-seekers. Reserva Nacional Coyhaique (USD$3 entry fee): Only 5 km away from Coyhaique, the Reserva Nacional Coyhaique can be reached by foot in 1h30, where you will get a view on the city but also on the enormous basalt pillars of the Cerro Mackay. Lago General Carrera: The lake measures 2240 km2 and is partly situated on the Argentinean side, where it is named the Lago Buenos Aires. If you take the Carretera Austral, the road south of Coyhaique, you will drive along the west bank of the lake. Before reaching Balmaceda, you can take the road indicating Cochrane to go trekking into the Reserva Nacional Cerro Castillo. From Puerto Rio Tranquilo, you can leave to the Parque Nacional Laguna San Rafael for trekking, on an excursion to the San Rafael glacier (USD$220) or on a cruise to explore the beautiful caves of Capilla de Marmol (the marble chapel). Dali (Lautaro, 82): Enjoy an intimate and unique experience in a restaurant with only four tables, no menu and an excellent service. A helpful and hospitable staff will make you choose out of 6 starters, mains and desserts, all elegantly presented and made with regional ingredients. An unforgettable experience in Coyhaique (USD$20 per person). Ruibarbo (Baquedano, 208): A small gourmet restaurant run and served by an inventive pastry chef. The set menus for lunch are affordable and do not hesitate to fall for a desert if you still have space! Excellent and friendly service and an extensive wine list. A sober and clean setting. Music can be a bit loud (USD$15 per person). There is a cash point for VISA. Do not hesitate to take out some cash for the rest of your trip as you may not find any other VISA cash point in the following sites. Conaf (Ogana, 1060, opened from 9h to 20h Monday to Samedi and from 10h to 18h on Sunday): Useful information for trekking. While Puerto Natales is mostly known for being the point of entry to the legendary Torres del Paine park, it is also a town worth visiting. The succession of pastel colored houses and the superb light shining on the town is in perfect harmony. Museo Historico (USD$1.50 entry fee, opened from 8h to 19h Monday to Friday and from 10h to 13h and 15h to 19h: Perfect for those who need a rapid class on the history of the region before exploring Southern Patagonia. Mirador Dorotea (USD$7.80 entry fee): A beautiful one day trek across a forest of lengas, ending with a viewpoint on Puerto Natales and the Glacier Valley. Parque Nacional Torres del Paine: Many consider Torres del Paine as the most beautiful national park of the continent. Classified as one of the UNESCO biosphere reserve since 1978, the park shelters a great amount of different animal species, including nandous, condors, flamingos and guanacos. 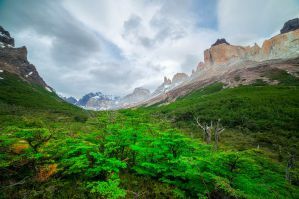 The park was named after the spectacular granitic massif Torres del Paine, elevated more than 2000m above the Patagonian steppe. However, tourists and hikers also come to explore the park's many shining blue glaciers, wild forests, rivers and lakes. Do not forget to bring clothes suitable for a rainy and windy weather and a good camping kit (synthetic sleeping bag, windproof tent, warm clothes) if you decide to spend the night in the park. If you wish to sleep in a hotel or a refuge, you must book beforehand. When you organize your itinerary, always make sure to include one or two days of transportation. Trekking in Torres del Paine: Most people leave between 3 to 7 days. 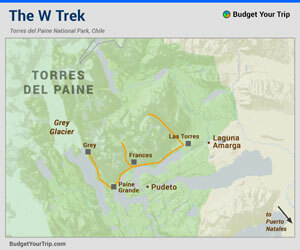 Two treks, the Circuito Paine and the Circuito W, are the particularly famous. The Circuito Paine (112 km) consists of the W trek but it then also continues towards the rear of the massif. You will need between 7 to 9 days to achieve the Circuito Paine. On the other hand, the Circuito W (71 km) can be done in 4 to 5 days. It includes some of the most beautiful sites of the park, such as the Mirador Las Torres, the Valle Francés and the Lago Grey. If you have less time to spend in the park, or you wish to discover less known areas of the park, there are also other itineraries that you can take. For a one day trek, we recommend that you walk from the Guarderia Pudeto, on the park's main road, towards Salto Grande, a beautiful waterfall between the Lago Nordenskjold and the Lago Pehoé. Another easy trek is to walk up to the Mirador Nordenskjold, where you will get an incredible view on the lake and the surrounding mountains. You will find many agencies in Puerto Natales that offer organized treks with a guide, meals and accommodation included. Antares/Big Foot Patagonia is the only agency that has the authorization to organize treks on the glacier Grey (USD$142). The 5h trek does not require any experience and is possible from October to May, starting either at 8h30 or 14h30. Some agencies also offer kayak excursions between the icebergs of the Lago Grey. Perfect to see the glaciers from closer! If you want to discover the park on a horse, contact the office of the Hotel Las Torres (http://www.lastorres.com) for more information. The Singular Restaurant (Puerto Bories): A cozy modern bistro with comfortable leather sofas and an incredibly beautiful view. Perfect for a special evening, which will turn into an unforgettable experience. Innovative French and Chilean fusion made with local ingredients. Great vegetarian options (USD$18 per person). Café Kaiken: Arrive early to get a table at this intimate and unique five table restaurant. Service is slow as one couple is cooking and serving but very friendly and welcoming. Excellent food for a reasonable price! (USD$10 per person). Afrigonia: Created by a Zambian-Chilean couple, the original Afro-Chilean fusion restaurant serves fragrant rice, fresh ceviche and mint roasted lamb (USD$18 per person). Conaf (Baquedano, 847, opened from 8h30 to 12h45 and from 14h30 to 17h30 from Monday to Friday): Nacional park office. The old penitential city is now appreciated by many tourists for being one of the most austral city of the world. In the 1980's, the exploitation of one of the world's most important hydrocarbon reserve enabled the spectacular development of the petrochemical industry, dividing Punta Arenas between industry and tourism. Plaza Munoz Gamero: The Plaza Munoz Gamero is surrounded by wealthy houses and conifer trees. In the center of the square, a monument representing the 400th anniversary of Magellan's trip was erected in 1920 by José Menéndez. Cementerio Municipal (opened from 7h30 to 20h): A fascinating cemetery with an unusual combination of extravagant graves and tombs of modest immigrants. Museo Regional de Magallanes (USD$1.50, opened from 10h30 to 17h every day except Tuesday and from 10h30 to 14h from May to December): The beautiful end of XIX century house of a rich and powerful sheep farmer has been transformed into a History museum with an amazing collection of Art Nouveau objects. The café built into the old housemaids' lodge is very nice. Costanera del Estrecho: Enjoy a walk or a bike ride along the coast avenue of Punta Arenas, where you can see the vestiges of old docks and boats dating from the beginning of the city's foundation, in XIX century. You will also pass through the active port of the city where hundreds of boats travel across the world and to the Antarctic. Mirador Cerro de la Cruz: From the top, you can enjoy a panoramic view of the city, with its colorful roofs and streets that descend to the Strait of Magellan. On the horizon you can see the boats that sail the southern seas, to Tierra del Fuego Island, Monte Sarmiento and the southern area of the Brunswick peninsula. Municipal Market: Buy fresh fish and seafood, taste a typical Chilean dish, meet the artisans of the region and discover their products. Fuerte Bulnes and Puerto del Hambre: Discover where the history of the region began to shape itself, only 60 km south of Punta Arenas. While the Fuerte Bulnes is now a historic reconstruction, it gives a good idea of how the first town in Patagonia looked like. On the coast, you will notice a few remains of old shipwrecked boats. As you explore the area, you will probably pass by Rinconada Bulnes, a small fishing village, Rio San Juan, an excellent place to go fishing and hiking but also Puerto del Hambre, on the coast of Bahia Buena. Puerto del Hambre was given its name due to its tragic end. Captain Sarmiento de Gamboa founded the city for the King Don Felipe in March 1584 but this attempt at Spanish colonization ended when all the inhabitants perished from starvation. Finally, we recommend that you also visit the Bahia Mansa, a small fishermen's bay full of colorful boats. Isla Magdalena - Monumento Natural Los Ping�inos (USD$11 for adult entry fee and USD$6 for children): The Magallanes region is famous for its large amount of penguins. About 35 km away from Punta Arenas, you can visit the enormous penguin colony between October and March. During this period of the year, penguins migrate from warmer waters to Patagonia in order to build their nests. During the 5h excursion, you will also be able to see different types of marine birds, sea lions and dolphins. If you do not have time to take the boat from Punta Arenas and reach the island, you can also discover the Seno Otway (65 km north of Punta Arenas) penguin colony, from March to October. La Marmita (Plaza Sampaio 678): A very good Chilean restaurant with excellent vegetarian options and takeout service as well. The casual ambiance of this classic bistro is perfect for a relaxing meal after a long trek (USD$15 per person). Sotito (O'Higgins, 1138): Do not get distracted by the outdated look of this restaurant. While the ambiance might not get funky, the food doesn't disappoint. Try the region's speciality, the centolla (King Crab) at Sotito and (USD$18 per person). Remezon (21 de Mayo, 1469): A cozy restaurant serving classic dishes with a touch of originality. Share a garlic soup for starters and try the black hake and its spinach casserole for mains (USD$15 per person). La Mesita Grande (O'Higgins, 1001): Enjoy one of their thin and crispy pizzas covered in organic toppings and if you have room for dessert, you will not get disappointed by their homemade ice-cream (USD$7 per person). La cuisine (O'Higgins, 1037): A wonderful adaptation of Chilean products to French cuisine. You will find excellent vegetarian options, delicious seafood served with ratatouille, salads or vegetables. The cheese, the wine, the escargot and even the homemade paté are all up to the standards of French cuisine (USD$15 per person). Conaf (Bulnes, 309, opened from 9h to 17h Monday to Friday): Information on the parks in the region. The real end of the world is here, in Puerto Williams, the only town on the Isla Navarino but more importantly the most southern town of the world. With only 2 500 inhabitants, Puerto Williams is much more quiet than Ushuaia. The Isla Navarino is pure heaven for trekking lovers who demand for more evergreen forests, hidden blue lakes and incredibly wild nature. Museo Martin Gusinde (at the intersection of Araguay and Gusinde, opened from 9h to 13h and 15h to 18h30 Tuesday to Friday and only from 15h to 18h30 on weekends): The museum pays tribute to a German priest and ethnographer who worked with the Yahgans native population from 1918 to 1923. Dientes de Navarino: A 5 day trek (4 days during summer time for experienced hiker) perfect to immerse yourself into the wild landscape of southern Patagonia. The 53,5 km long trek leaves from the border of the city but it is best to leave with a map or GPS (can be rented in a tourism agency) due to the limited markings. If you only have a day to spend in Isla Navarino, we recommend that you do the first part of the Dientes de Navarino trek, to reach the Cerro Bandera. The 4h trek begins with a very steep path across a forest of lengas to then reach the top where a Chilean flag is planted. La Picada de los Veleros (Piloto Pardo, 222): Fresh seafood dishes and good wine are served in a family-style dinner (USD$12 per person). Puerto Luisa Cafe (Costanera, 317): Enjoy a good "english-style" tea, an espresso drink or a variety of cakes and pies in the world's most southerly cafe. A peaceful and comfortable place with amazing views on the Beagle Channel and its mountains (USD$5 per person). El Resto del Sur (Ricardo Maragano, 146): This restaurant delivers simple yet delicious food. Fantastic king crab dishes and excellent desserts (USD$10 per person). Tourism Office (at the intersection of Piloto Pardo and Arturo Prat, opened from 8h to 13h and from 14h to 17h Monday to Friday): In a small kiosque, the office offers many helpful information about trekking and weather conditions in the region. It also distributes maps of the city of trekking paths.